Domaine de Chaussy is pleasant 5 star campsite set on a wooded hill in the heart of the Ardeche countryside. Domaine de Chaussy is an ideal campsite for those looking for a holiday in the sun where they can relax because of the 15 hectares of pleasantly landscaped grounds. You can also take part in a variety of onsite and off site activities and explore the surrounding area. The Ardeche region of France is well known for the variety of activities that are available and Domaine de Chaussy is well placed to take advantage of many of them. If you love the water then you’ll want to head to the Ardeche River. Along its length you’ll be able to find plenty of companies offering canoeing, kayaking and canyoning and furthermore we’d certainly recommend you take a trip down to Pont d’Arc. One of the nearest towns to Domaine de Chaussy is Ruoms. Located just over 2km from the campsite you can cycle there in around 20 minutes or drive in a little over 5. Ruoms is a pleasant medieval town which is well worth visiting, boasting a variety of shops, restaurants and other amenities. The bonus to any good campsite is a great swimming pool area and that’s exactly what you get at Domaine de Chaussy. Covering 2700m2 the pool complex boasts an area dedicated to younger swimmers with a paddling pool and water games and another pool area offering a large heated pool, diving pools and water slides. 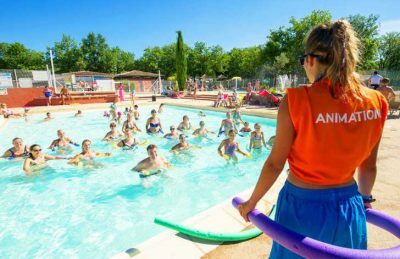 Domaine de Chaussy is fun and active family friendly campsite and as such boasts a comprehensive range of on site activities and facilities. On site activities at Domaine de Chaussy include multi sports field, mini golf, table tennis, tennis, boules, archery, cycle track, playground, trampoline, football, volleyball, running course, fitness area and cycle hire. Facilities available at Domaine de Chaussy include WIFI, restaurant, snack bar, takeaway, bar, groceries, animation team, games room, tv room, washers and dryers. Accommodation at Domaine de Chaussy campsite includes a range of 2 and 3 bedroom mobile homes from Canvas Holidays .